Hello, fellow Filipino expatriates in Singapore, it’s about time that you get to know this really good tool that you can rely on for zero-margin FX rates, guaranteed fast transfers and really cost effective. I know there are so many “good” options in Lucky Plaza, or even if you are pretty integrated in Singapore, you’ll know that banks like DBS, POSB, and the like, can also offer those kinds of options. However, I think it’ll be worth recommending and trying out this new disruptor in the Fintech Industry. This is known as the InstaREM. Founded by Prajit Nanu, formerly global sales director of TMF Group and VP, this young innovative organization is making global money transfers very easy! InstaREM offers Zero-margin FX Rates, No Hidden Charges, Easy Sign up and transfer to 55+ countries. Sign up now - https://www.instarem.com/signup. #DoMore on Overseas Money Transfers, which is very very very very, did I say very, impressive because you can see that there is a zero-margin with their exchange rates. This means that InstaREM manages to provide their customers Zero-Margin FX rates - mid-market rates sourced directly from Reuters, with absolutely no margins added! They transparently display their remittance fees, and the exact amount that the recipient would receive. You can even get rate alerts so that you know when to send with better rates! Plus, you can even see how it compares to other similar remittance services, like World Remit, TransferWise, OCBC Bank, or DBS. So, you are guaranteed to have better chances with your money transfers. 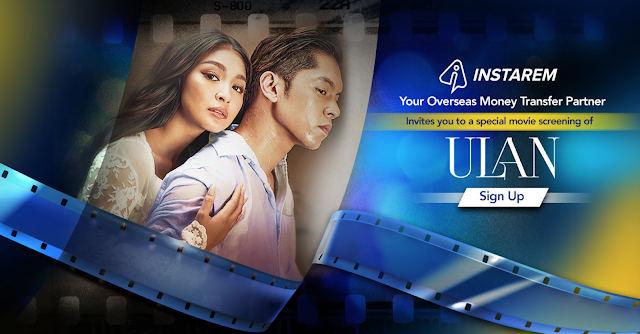 On a related note, you may want to sign up with InstaReM.com to send money to Philippines and stand a chance to win FREE TICKETS to a private movie screening of Ulan, starring Nadine Lusture & Marco Gumabao on 24th March 2019!